Could difficulties or opposition be keeping you from pursuing a course of action? How persistent are you? Persistence – firm or obstinate continuance in a course of action in spite of difficulty or opposition. A course of action begins with excitement and enthusiasm. You have a vision of something that you want to accomplish and are filled with ideas and plans of how to bring that vision into reality. As you begin to put those ideas into action you are excited to see the potential they hold. As you implement your plans there is much enthusiasm to see them take shape. But, what happens when those ideas lead to difficulties? What happens when your plans are met with obstacles? A course of action needs more than excitement and enthusiasm! A course of action requires persistence! Jesus was teaching His disciples about prayer when He told them this story. Jesus knew story-telling was an effective way to teach spiritual lessons. His humanness gave Jesus personal experiences so He could physically understand from our perspective and tell stories that bridged the gap between the ways of the flesh and the ways of God. This story speaks of persistence. There will be unexpected times when you need something you don’t have. No matter what cupboard you look into there is no bread, no cereal, no cookies; your cupboards are empty! What do you do when faced with empty cupboards? You ask, you seek, and you knock on the door of the one who has what you need. But what if your question isn’t answered the way you want it to be? What if your seeking doesn’t bring about the results you need? What if the door isn’t opened to your knocking? This is when you have a choice. You can go back home believing that it was a waste of your time to ask. You can decide the one you thought could help you really couldn’t. You can determine that you will never knock on that door again. Or, you can choose to be persistent! You can choose to keep asking, keep seeking, and keep knocking because you know deep down inside that the One who’s door you are knocking on does have what you need, will provide what you are seeking, and in the right time you will receive it. 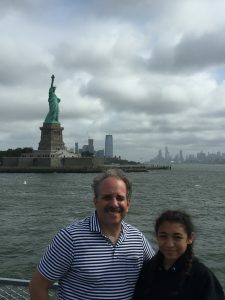 Mark, Kayla, and I visited the Statue of Liberty, and Ellis Island yesterday. 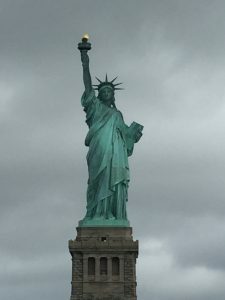 Before we went I read about the history of the Statue of Liberty and learned that her story was filled many difficulties, opposition, and delays from the time she was first conceived in 1870, until she was finally placed on her pedestal in New York Harbor on October 28, 1886. 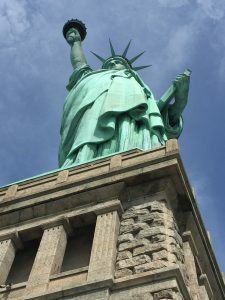 Though her presence has been, and perhaps still is, embraced by many and opposed by some, today the Statue of Liberty is the most visited National Park in America. I am inspired by her story because it reminds me that I can’t allow difficulty and opposition to stop me from pursuing what I believe I’m called to do. And though I know I can’t accomplish in on my own I can keep asking God and He will give me knowledge and understanding. And though I don’t seem to have the time to work on it, I realize that when I seek God, He will help me to make it a priority over other things. And though it seems like it will never come together, I can choose to keep knocking, for God will make a way when there seems to be no way. Nothing good has come from nothing! Now when I look at the Statue of Liberty I see an incredible work of art that has stood tall for generations holding high the torch that enlightens the world, and the book with “July 4, 1776,” representing freedom for all, and I’m reminded of the importance of persistence! You too are called to a course of action that is meant to stand tall for generations. As a child of God you are the Light of the world; meant to be held high and bringing light to the world around you. You have been given a book of freedom, the word of God, to guide you and to share with others. Holding onto these things; cherishing them and refusing to let them go, and extending them to others will be met with difficulties and opposition, but when you persistently stand tall, firm on the promises of God, you will leave a lasting legacy! Next Next post: Jesus Alone is Our Rescuer!